Mr Barber argues that 2009 could be a turning point, despite its grimness. The head of the TUC has warned the UK faces "mass unemployment" next year and called on the government to tackle it with a "more balanced economy". 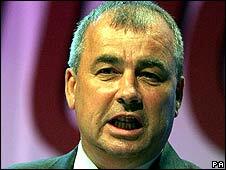 Brendan Barber said 2009 would be "a grim year" with unemployment set to rise every month. Making the recession "as short and shallow as possible" should be a top priority, and may involve more support for the banks, he added. But he said 2009 could be a decisive turning point if bold action was taken. The government should look towards "a fairer, more balanced economy delivering sustainable prosperity," to counter the recession and save jobs, Mr Barber said in the union's New Year message. On Monday, The Chartered Institute of Personnel and Development warned that at least 600,000 jobs could go in the UK next year. It said the time between New Year and Easter will be the worst for job losses since 1991. He blamed the finance and banking sectors for the recession, but said the government should be prepared to offer further financial assistance to troubled financial institutions. "Banks are putting building up their balance sheets and paying back government loans as their top priorities. But they hold high levels of toxic debt which prevent them from dealing with other banks in a normal way. "The government and the Bank of England must, therefore, consider injecting even more support into the financial system to get credit flowing again," he said. Mr Barber said that the government could not be expected to come to the rescue of every troubled company, but that it should be prepared to provide "short term assistance to companies in sectors vital to the future of Britain". And he called for better benefits and training for the unemployed, urging them to be treated "not as potential scroungers but victims of economic forces beyond their control". The year would be tough, Mr Barber said, "but it can still be made positive if it becomes a turning point - the year in which we set out to build a deliberately different kind of economy". "We have given far too much weight to the interests of the financial sector, and began to believe it could create wealth simply by moving it around, rather than through long term investment in the goods and services that people want and need," he added.